Left, "Coordinator 2" by Justin Bean and, right, "Ruche 0352.32" by Karen Freedman. The Esther Klein Gallery, a small gallery space tucked away in the Science Center, is known for creating engaging and surprising exhibits that merge science, art and technology. (You may remember "Crystal Beings," their striking spring collection of crystallized books and urban geodes.) Their latest exhibit, "MathThematic," open Wednesday, Oct. 7 through Friday, Nov. 20, brings mathematics to the forefront. Curator Gaby Heit has gathered artists working in diverse media who are all somehow inspired by a subject so alternately loved and hated by school children. 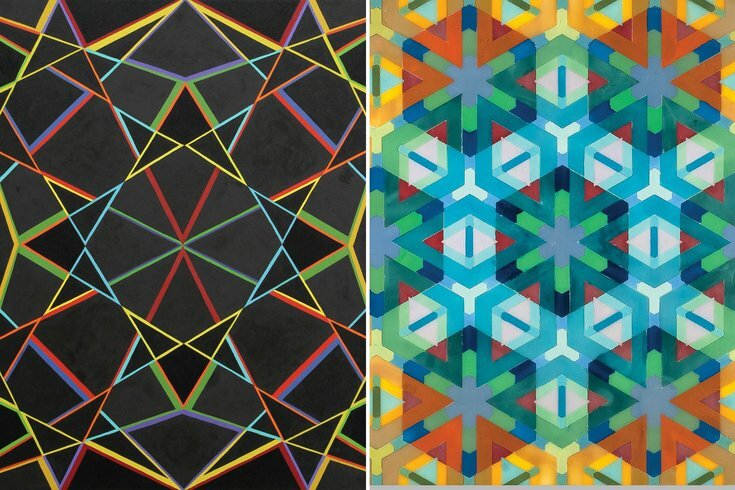 Some of the included works are directly inspired by geometry or fractals while others find themselves naturally following mathematical patterns. Both two- and three-dimensional works can be found in the collection, from paintings and paper sculptures to video and interactive works. The artists featured in "MathThematic" include Justin Bean, Regina Ceribelli, William Cromar, Jessica Curtaz, Chris Eben, Robert Fathauer, Karen Freedman, S. Leser, Marco Mahler and Henry Segerman, Gabriele Meyer, Maximilian Morresi, Brittany Phillips, Bruce Pollock, Mike Tanis and Andrew Cameron Zahn. An opening reception will be held Wednesday, Oct. 14, 5-7:30 p.m. as part of DesignPhiladelphia.